Heraklion, Crete Island, Photo Travel Guide to Greece. The largest and most southerly Greek island, Crete is rich in historical remains and scenic variety. Along the northern shores there are modern resorts. Alongside lie the scattered remains of older civilizations – Minoan palaces, Byzantine churches, Venetian castles and sites of more recent struggles. Crete is divided into four prefectures – Chania (Hania), Rethymnon (Rethimno), Heraklion (Iraklio) and Agios Nikolaos – and has a good road network and regular communications. 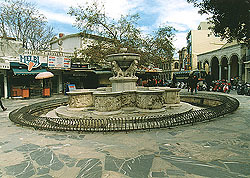 Heraklion, the largest and busiest town on the island, has a variety of nightlife and sightseeing to offer. 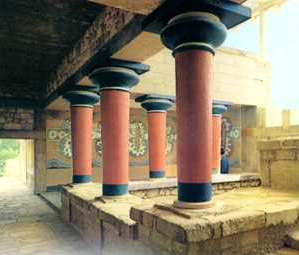 In the prefecture of Heraklion are three of the most important Minoan centers – Knossos, Phaestos and Malia. Crete is well known as the setting for the battle between Theseus and the Minotaur, and the ruins of Knossos are popularly held to be the site of the labyrinth. With full of tropical beaches, traditional villages, everyone with a different history, a huge variety of gorgeous landscapes, remains from ancient civilizations, you've got people here writing history for the last five thousand years. N. Kazantzakis was inspired and wrote his famous book " Zorba the Greek" in Crete. Crete is the one for those who want it all. History: The Minoan Civilization of Crete was one of the world's most ancient, reaching a peak around 1600 B.C. The island was conquered by the Romans in 67 B.C., and was later held by Byzantium, except for a period of Arab occupation from 823-961. It was taken by Venice in 1204 and Turkey in 1669. Crete was contested between Turkey and Greece until union with Greece was proclaimed in 1908. During the Second World War, Crete was the scene of the first large-scale invasion by air when German paratroopers took the island. >> Crete Island : Chania, Heraklion, Lasithi, Rethimno, Gavdos Island.